Chak De! 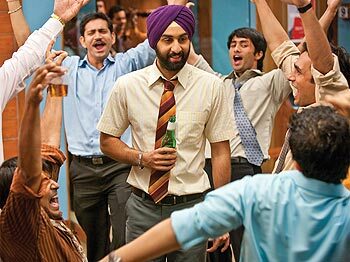 India team Shimit Amin, director, and Jaideep Sahni, writer, are back with their new film, the curiously titled Rocket Singh Salesman Of The Year. Starring Ranbir Kapoor and newcomer Shazahn Padamsee, the film is set for release on December 11. Shimit tells Patcy N what it's all about. Why was it necessary for Ranbir's character to be a sardar? No, it was not. But this is how the character first came to me when I was thinking of the story. There is no reason why every protagonist in every Hindi film has to look like a hero. Why is there no buzz about the film even though it is a Yash Raj project. Why is the marketing and publicity of the film so low-key? Chak De did not have any buzz either. In fact, I am experiencing a sense of deja vu as people asked the same thing -- that why we weren't promoting Chak De when it had Shah Rukh Khan. Why a film on the life of a salesman? What aspect of his life does the film stress on? We have always made films about college life but never about life after college. This film is about life after college. When you are in college, you are always wondering what your office, colleagues or boss would be like. We just found this phase very fascinating as one gets to discover a whole new world, and that is why we thought of making a film which explores this new world. What made you select Ranbir for the film? Ranbir was our first choice though we thought of him only after the script was ready. It is actually a process where you think of everyone to make this film work. We wanted a young actor to play the part of a fresh graduate, and since only a handful of people in our industry fit in that group, we thought of Ranbir. Plus, we wanted a person who could understand this kind of character better. Your last film had Shah Rukh Khan. Compared to him, Ranbir is like a newcomer. How different are the two? It was like working with two extremely talented people. Both have the same perspective about their work. It's like they are two different individuals yet the same people. They both tend to give their inputs when they are working, which is helpful, as actors are the ones who breathe life into the characters. Why is the character called Rocket Singh? What made you decide on this unusual name? The character's name is Harpreet Singh but he is called Rocket Singh. We can't reveal why he is called Rocket Singh as it is a key moment in the film. As the film is set in Mumbai, we shot it in the city only. We shot for 95 days. Why such a long break after Chak De? We started working on this film right after Chak De. Jaideep was writing and we were just bouncing off ideas. It was a very difficult and unusual script so it took time for us to develop. I think when the audience will see the film they will say it was worth it. These guys will sell you anything!